January | 2011 | okay, peanut. I’m not happy. I think it was two seasons ago, though my timing may be wrong, that they did this for the first time. So many reruns that I’d forget what the storyline was from the last episode. I stopped watching, bought the DVD set on eBay, and watched the entire season in one weekend. Believe me, it’s much more satisfying during a season like that. They’re doing it again. I can’t remember if this is the second or third week of reruns (Er, or maybe longer? ), but it’s getting old again. I don’t remember shows ever being like this. Then again, I probably don’t watch enough television to know. I know, you can hear them around here lately. Crickets. January has been a sick month for us so far. I had the stomach flu (or food poisoning) the weekend of the 8th. Ugh. Two weeks later, which was this past weekend, I got the real flu. 4 days worth. It was awful. Lily has yet to get either version of the flu. Fingers crossed that it stays that way. Forever. Hey, a girl can dream, right? Justin now has the flu. Oops, sorry Love. I like to share, but I guess I need to learn where to draw the line, huh? I’m almost back to normal. And really hoping I don’t get something else this winter. I might not make it – mentally, that is. Moms just can’t get sick. Today, though. 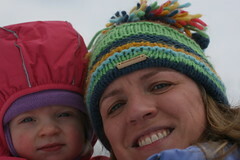 Today was a good day; I felt good enough to function without feeling weak, and I got to enjoy the snow with our Peanut! 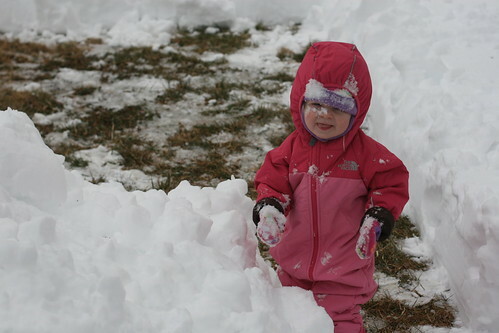 She loved it, right up until she got cold and wanted to go back inside to warm up. Can’t say I blame her, though as an adult, it really wasn’t that cold out today. Of course, I have much more insulation to keep me warm. You know, the natural type of insulation. That’s another thing I hope she doesn’t get. Ever. 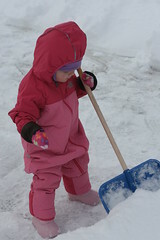 Anyway … she helped us shovel with her own mini-shovel – after daddy taught her how to use it, of course. 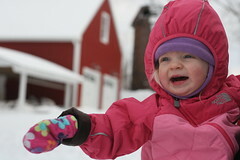 She picked up snow (and looked at it with amazement and wonder), rubbed snow on her face (Without prompting! 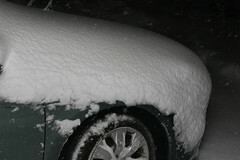 ), and helped me clean off the cars. Shouting “Huck!” at the window where he sat was great fun. 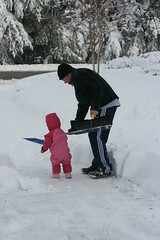 Who knew shoveling the driveway could be so much fun … we had a blast! She made my heart melt at least a dozen times. 365 project (27) … hard at work. 365 project (26) … snow. Does this look like 4 to 6 inches to you? Yeah, I didn’t think so. By the time it was all said and done, we had 11 inches. 365 project (25) … keys. Husband is incredible with this thing. You name a song, he starts playing it. 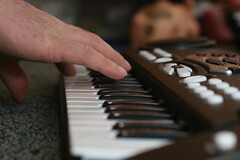 Never played a keyboard/piano in his life. I’m in awe. 365 project (24) … birr. 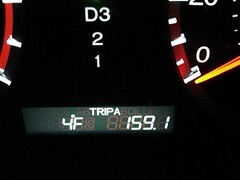 Because 4 degrees Fahrenheit is just too daggone cold! Have I told you yet about my other project for ’11? If not, here’s the first of 12. I plan to take a picture each month of the 3 (4 if Huck manages to make it in the photo) of us. Different places, silly faces, us just being us. I was inspired by this amazing photographer, Tara Whitney – if only we lived on the west coast! Her photography is beautiful, and so is her spirit. If you want to be inspired to be a better you, just the way you are, follow her blog. You won’t be sorry! So here’s January. 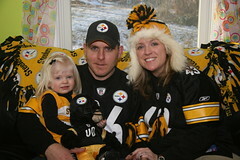 AFC playoff game, first Steelers touchdown. Woohoo! You must excuse the fingerprints on the window. I walked over to the window earlier in the day with Windex and paper towels in hand, and then couldn’t bring myself to wipe away the memories just yet. When Justin walks Huck, Lily climbs up to the window and watches. We tap on the window and exchange waves; it truly warms my heart. Here’s a photo from earlier in the day, too – pregame. January has been interesting so far. Not bad, but not great. I’ve been hit by the stomach flu, and think I might have the regular flu now. I think I might also have some sort of infection – I’ve been sick since the stomach bug two weeks ago. On a happy note, Lily was amazing on her first two flights – I’ll write a post on some travel with infant tips later this week. We had a blast, and I know my mom enjoyed her time with Lily. 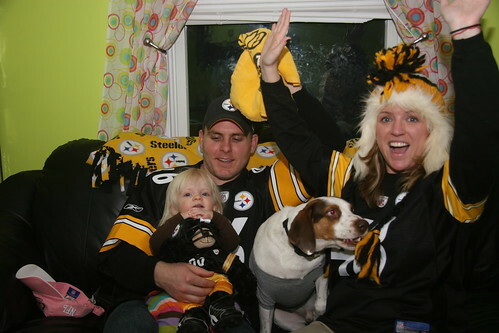 Just prior to our travel, we spent a great weekend in Pittsburgh; watched the game with family we don’t often get to see, and the Steelers won. Woohoo! So there you have it – our January in a nutshell, to date. I guess it’s still okay to say it … Happy New Year!